While the 1960s brought on the Jet Age, the Beatles, moon landings and more, it also was a time of strife. The Vietnam War was not without its opposition, with students, anti-establishment activists, and mothers forming the largest groups of resistance. Mothers in particular were a strong sub-group of protesters, with groups such as Another Mother for Peace forming significant portions of anti-war advocacies. The phrase “war is not healthy” forms the centerpiece for Another Mother for Peace, and has become a mantra that has continued from the mid-sixties to the present, standing in place as a monolith to opposition against war and intervention. Founded in 1967 by a group of women who opposed the Vietnam War, Another Mother for Peace’s mission was to create a non-partisan and non-profit organization, intended to educate women to take an active role in eliminating war as a means of solving disputes between nations, people, and ideologies. 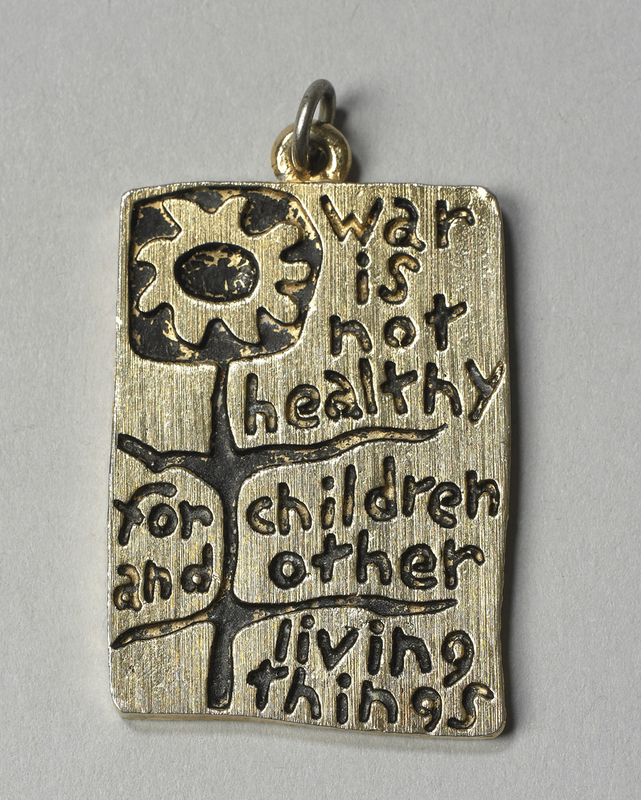 The logo that appears on this pendent represents the organization’s vision: a sunflower accompanied by the words “war is not healthy for children and other living things.” The choice of the sunflower is extremely important to the message, as the sunflower will always move to face the life-giving rays of the sun. Their message is intended to communicate their horror to their representatives in one concerted action. They sought to separate themselves from other protesters, to show that the middle-class was also awakening and enraged. Eventually their message turned into a newsletter, and encouraged readers to make their voices heard by organizing and communicating with other citizens and their own representatives. Throughout the war, Another Mother for Peace continued the effort to oppose the U.S. involvement in Vietnam, based upon the fear that they were raising their sons only to send them off to war. While the design may be childlike, the sentiment behind it is anything but; it is a statement of conscience, making AMP one of the most eloquent and effective anti-war voices of the twentieth century. It appealed to a broad spectrum of Americans, and shared outrage with all mothers, issuing a rallying cry for peace and targeting all parties involved. Starting with what they believed to be the patriotic duty of every citizen, they spoke up for ‘collective conscience’ and headed numerous campaigns with demonstrative effects on Congress. Once the war finally ended, they continued to speak out for causes they felt directly impacted their families. Still a functioning non-profit today, what began as a group of concerned mothers in a living room spurred into a global movement, asking the world to consider peace for all of humanity. Another Mother for Peace, “History,” http://anothermother.org/about. “War is Not Healthy,” February 15, 2005, http://backspace.com/notes/2005/02/war-is-not-healthy.php.